Acupuncture is an effective treatment modality for Achilles tendon disorders. Two clinical case histories were published by Dr. Hawks demonstrating that acupuncture is “highly effective, with rapid results for both acute and chronic Achilles tendinopathy and was performed easily in an austere environment.”  Dr. Hawks works at the Mike O’Callaghan Military Medical Center at Nellis Air Force Base in Nevada and the treatments were administered to personnel while deployed overseas. Hawks, Matthew Kendall. “Successful Treatment of Achilles Tendinopathy with Electroacupuncture: Two Cases.” Medical acupuncture 29, no. 3 (2017): 163-165. 4. 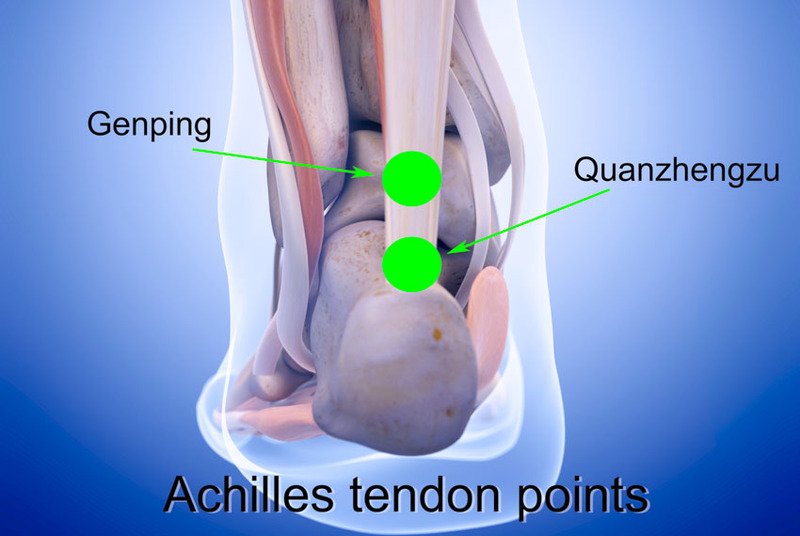 Speed C. Acupuncture’s role in tendinopathy: New possibilities. Acupunct Med. 2015;33(1):7–8. Imaeda, Miwa, Tatsuya Hojo, Hiroshi Kitakoji, Kazuto Tanaka, Megumi Itoi, and Motohiro Inoue. “Effect of electroacupuncture stimulation on long-term recovery following Achilles tendon rupture in a rat model.” Acupuncture in Medicine (2018): acupmed-2016. Zhang, Bi-meng, Li-wei Zhong, Si-wei Xu, Hui-ru Jiang, and Jian Shen. “Acupuncture for chronic Achilles tendnopathy: a randomized controlled study.” Chinese journal of integrative medicine 19, no. 12 (2013): 900-904. Inoue, Motohiro, Miwa Nakajima, Yuki Oi, Tatsuya Hojo, Megumi Itoi, and Hiroshi Kitakoji. “The effect of electroacupuncture on tendon repair in a rat Achilles tendon rupture model.” Acupuncture in Medicine 33, no. 1 (2015): 58-64. Chuan-en, WANG Quan-dian1 WANG, and Q. I. Xiao-qin. “Experimental Study of the Effects of Electro-acupuncture On Rat’s Achilles Tendinopathy [J].” Journal of Chengdu University of Traditional Chinese Medicine 3 (2009): 027.